There are actually tons of different Palicoes out there in the wilds of Monster Hunter World for you to track down and help. In this Monster Hunter World Grimalkyne guide, we'll be walking you through how you can find the Ancient Forest Palico tribe as easily as possible, and how you can go about helping them out. For a full list of the three additional Grimalkyne Tribes in Monster Hunter World, including where they're located and how you can help each one, consult the guides just below. The Ancient Forest is the very starting area of Monster Hunter World. Each successive Palico Tribe that you help out will grant you with a new reward item, and it's the Grimalkyne Tribe located in the Rotten Vale that you want to be working your way towards as this Tribe rewards you with the unique Plunderblade, whih helps you harvest rare items from monsters. 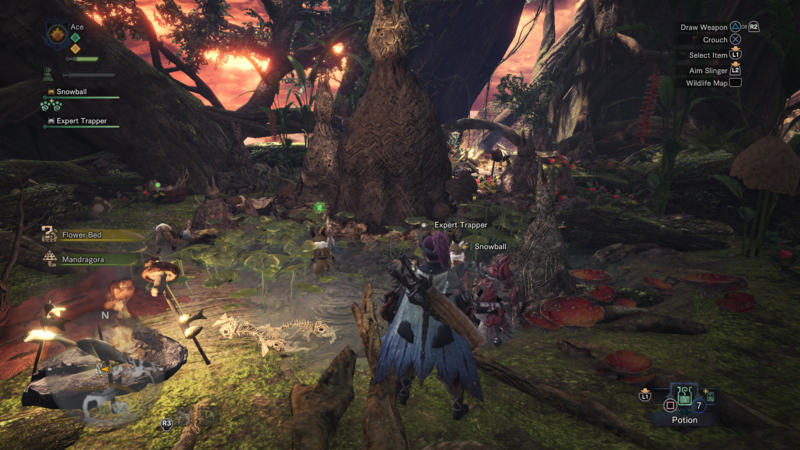 Starting off in the Ancient Forest, you’ll need to begin your search for the Bugtrapper Palico Tribe from either of the northern Camps on the map. You’ll now need scour the map for Doodles, which you can examine to build up your discovery meter, just like you would do with any normal creature in Monster Hunter World. After you’ve successfully filled the discovery meter, go into Expedition mode, and follow the trail you’re given by the Doodles, which will lead you to the highest reaches of the Ancient Forest map in area 17. You’ll eventually come across the ground for a new Campsite, and after you’ve successfully swung your way across a few vines, you’ll find the Bugtrapper Grimalkyne Tribe. Fortunately, there’s no quest to undertake with the Bugtrapper Tribe, as they’ll immediately give you the Flashfly Cage for your Palico to equip as soon as you discover them. The Flashfly Cage is a useful item to use when you want to stun a monster often, and it’s a great item for your Palico to have in their arsenal. To change the item that your Palico currently has equipped, you’ll need to head back to the Tradeyard hub area in Astera, and into your own personal room. Once you’re in here, speak to your Palico, and select the obtain to change their currently equipped gear. Select their unique gadget, and change it to the Flashfly Cage. This new item is incredibly useful for fighting either powerful or quick monsters, as it can temporarily stun monsters that are caught in its considerable blast radius. 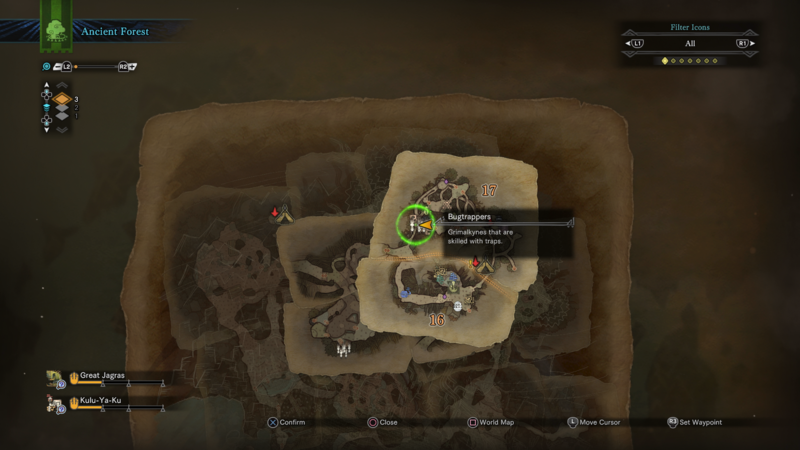 We might have come to the end of our Ancient Forest Grimalkyne Tribe guide, but make sure to continue ahead to our Wildspire Waste Grimalkyne guide, or our Coral Highlands Grimalkyne guide, in order to quickly help out the Palico Tribe in the next region of Monster Hunter World, and bring yourself one step closer to the Plunderblade.